In this lesson, we will learn how to use place value strategies and base ten blocks to solve story problems calling for the addition of two 3-digit numbers. 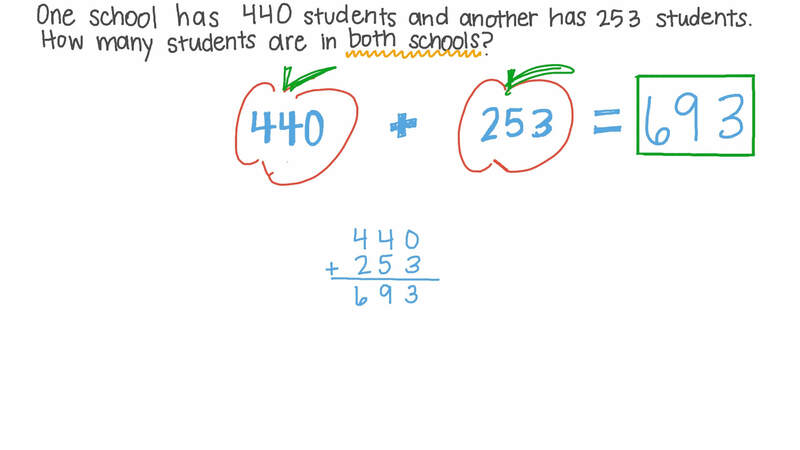 One school has 440 students and another has 253 students. How many students are in both schools? A shop sold 790 books on Wednesday and 205 books on Thursday. How many books were sold in those two days? A farmer has 377 hens and 293 ducks. How many birds does he have all together? On Sunday, 686 tourists visited the museum. On Monday, 126 tourists visited it. How many tourists visited the museum on those days? A man has 675 LE and his brother has 214 LE. How much do they have altogether? A man bought a mobile phone for 506 LE and a camera for 390 LE. How much did he pay for both of them? A girl bought toys for 161 LE and a mobile phone for 394 LE. How much money did she spend? If a person bought a watch for 113 LE and a shirt for 740 LE, how much did he pay for both of them? 377 ships crossed the Suez Canal in January, and 573 ships crossed it in February. Find the number of ships that crossed the canal in the two months. What is the next equation in the pattern?